Don't know how many people are affected, but RCN has confirmed an Internet outage in the area. "The work required to pause the Harvard Allston Science Complex Project has been completed." That sounds more accurate. Have a nice weekend! As the Journal notes, the Behnisch-designed $1 billion Allston Science Complex for Harvard is currently on hold (despite the construction management team describing it as "complete"), so in the meantime it is interesting to learn about this Behnisch-designed lab in New Haven that is "a quite visible attempt to heal longstanding physical and psychological rifts in the surrounding community." It is not a co-developed structure, but it is a twist on the typical "university as owner and developer" model, as the 146,000-square-foot building was privately developed by Fusco Corp. and leased to Yale-New Haven Hospital and the privately owned building will contribute more than $1.1 million in taxes to New Haven. And the WSJ story ends with a paragraph that could be another parallel to the situation on Western Ave. Considering the site was a 25-foot hole in the ground for decades, the Park Street Clinical Laboratory is an entirely new and welcome experience for New Haven. "What had been a gash in the city is now a stepping stone," Mr. Svigals said. "It shows the hospital extending a hand to the community." Harvard Completes the Science Complex! What's in bloom on the Everett St Slope? Thanks for the help pulling weeds yesterday and, for the sake of the plants, hopefully we will get more than a sprinkle of rain this morning. The Everett Street Slope is looking much better, thanks to the efforts of neighbors who helped weed, water, and clean up earlier this month. Some of us will be meeting tomorrow (Wednesday) at 6:00 between Lincoln and Adamson streets to keep up the good work. Last month while on Cape Cod I had the pleasure of biking on the Cape Cod Rail Trail for the first time. It was clean, safe, beautiful, and welcoming to people walking, biking, and riding skateboards at speeds from 1 to 20 mph. 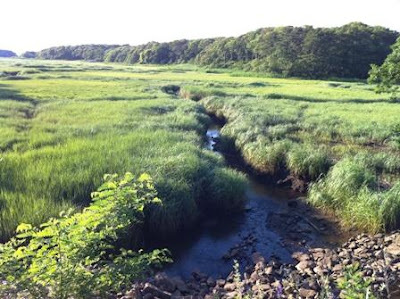 Birds, rabbits, and turtles were on or near the path, adding nicely the connection with the natural world. 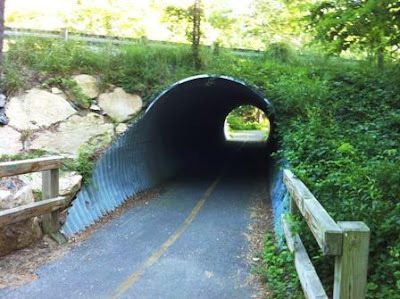 An enjoyable engineering feature was the underpasses that allowed travelers on the rail trail to continue their voyages without having to cross the busy roads above. 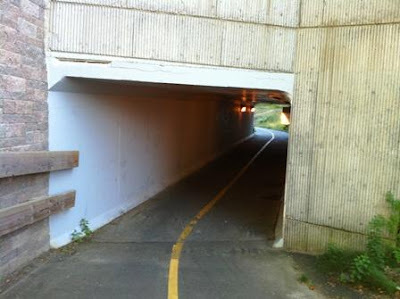 I have no idea how much money it cost to build these underpasses on Cape Cod, and I have no idea how much it would cost to add underpasses to the Charles River bridges that connect Allston and Cambridge and will soon get their once-in-a-lifetime reconstructions. But at the very least it seems reasonable to have a public and open discussion with MassDOT, DCR, and other interested parties about the cost, the design, and how underpasses might, or might not, improve the Anderson, Western Ave, and River Street bridges. then I highly recommend a trip to Fish Market on Brighton Ave for lunch or dinner. My wife and I ate there soon after it opened a while back and thought it was good, but not great. We went there again this past weekend and were wowed by how great it was! Imaginative, fresh, beautiful, and delicious food, all at a reasonable price for sushi. The crazy eggplant maki, jalapeno twister, and crispy crab maki were some of our many favorites. 458-460 Western Avenue (Boyne Pub) - Erect a outdoor patio for seasonal seating for patrons. In case you might be downtown with a free hour this afternoon, MassDOT is hosting a meeting about the reconstruction of bridges including the 3 bridges that connect Allston and Cambridge. Thanks for Lincoln St cleanup! Thanks to the work crew whose efforts today made the Lincoln St Green Strip look much better! that we've done the past couple weeks. and hope you can join us. A nice story in today's Globe about the turn-around of Roslindale Square and reminder that concentrated physical improvements on Western Ave (possibly at the CITGO station @ surrounding properties today, Harvard's old Verizon warehouse in the near future, the current Charlesview site in a few years after its residents have moved...) and creative programming (like the free summer concerts in Roslindale's Adams Park) could make a big difference. "Renewal can take place, even in the city’s neediest commercial areas. But only in finite steps." A large bio-tech company is going to expand in the Boston area. Should it join with Harvard to co-develop Harvard's Science Complex on Western Ave, or should it lease space in some buildings that are already built? Based on the data in this Globe story, it is a pretty easy choice. Harvard's billion-dollar 589,000-square-foot complex was to be home to approximately 1,000 employees. Spending a billion to make lab space for 1,000 is $1M per person and $1,700 per square foot. If Sanofi is leasing 112,000 square feet for $65M, that's $580 per square foot. (Globe story does not provide the length of the lease). Now there are a whole bunch of assumptions and unknowns about both of these projects, but the conclusion seems valid. Finishing the Science Complex as previously designed will probably cost more like $650M than $65M. But in the current real-estate market, a "drug giant" need only spend the latter to achieve a major expansion. Thinking about it this way supports my expectation that whatever Harvard and any partners will build on the Science Complex foundation will be much simpler and cheaper than what was previously designed. And leasing space in existing buildings will have to get much more expensive before it makes financial sense to build something new. It has sublet 30,000 square feet of space elsewhere in Cambridge, but is now close to leasing 112,000 square feet at 640 Memorial Drive, an MIT-owned building aimed at life sciences companies, for the new division headquarters. It sure is hot this afternoon, but by 6pm the sun will be heading down and maybe the temp will be below 90. Join us on Everett St between Lincoln & Adamson to pull weeds, water, clean up, and help our neighborhood look better. Crowds line a Cambridge Street overpass to watch the fireworks. A few neighbors made good progress on the Everett St slope earlier this week. Let's continue making the site look even better, especially considering that there is no rain forecast for the next several days and those plants need water to thrive and survive. Please join us on Tuesday, July 6 from 6 to 8 on Everett between Adamson and Lincoln Streets to help beautify this part of our community. Neighbors of all ages are welcome to participate - kids who want to pick flowers are especially invited. Bringing work gloves is recommended. 446 Washington Street - Create off street parking for two vehicles. 45 Radnor Road - Extend living space into the attic. This is a great story about the Boston Cyclists' Union collaborating with the Boston Transportation Department to make bicycling safer and more enjoyable in Allston. If you are one of the many cyclists who read this blog, please contact BCU to get involved.